It was an impressing welcome, unexpected visit, and truly warm hearted hospitality. Armona’s CEO Lorenz Weinstabl, who had been actively involved during the construction of the Atlantis Antalya in 2005 conducted a surprise visit to the vessels crew and his former new building on November 6th during loading at Holborn Europa Refinery in Hamburg, to exchange experiences, listen to inner feelings, take suggestions and criticism, to express values the companies has, and to explain the principles and procedures that Oil companies have imposed on operators and how these benefit the prospects of the industries goal, which is to avoid the occurrence of incidents, whether personal injuries or environmental damages. Emin Yusuf, the cook, prepared stunning cheesy pastry (poğaça) that fueled the discussions including the intensive and emotional dialogue with the Ratings that revealed what occupied their minds. Mahmut Cengiz, the C/E and his team Mehmet and Yunus presented tiptop machinery spaces and, whether ISPS or protective equipment, all was in place on board. Mustafa Mahir, the Master, is the “Charterers man”. They are full of good words to his and his team’s professionalism and performance The Master’s team is the operators dream: motivated officers that have been with Armona since the operator’s first day. Even the Cadet Faruk had joined an Armona Vessel for the third time. Well done! It was an impressing welcome, unexpected visit, and truly warm hearted hospitality. A wonderful crowd of charterers, brokers and owners connected at the renowned annual Clarkson’s lunchtime/afternoon cocktail at the Ciu Die Bar in Hamburg. During the event Lorenz Weinstabl and his son spoke with brokers and traders while enjoying some drinks and finger food. We would like to thank the co-hosts Jan Aldag (Clarksons Hamburg) and Richard Whittet (Clarkson London) for their fantastic reception. What an event! In the aftermath of Atlantis Tankers first time charter conclusion with Exxon Mobil their brokers Eastport Maritime invited to celebrate in Porsche’s Leipzig premises “The ultimate Porsche Experience”. It was a stunning day where officials presented the factories production and assembly plant and two highlights marked the day: Porsche’s brand new model, the Panamera, that was yet disclosed to the publicity, was already running down the assembly line and the second part of the program provided for test driving of all types of 911, Namara, Cayennes and Boxters, on the racing course or offroad on former DDR military tank test roads. On the picture is Yuri Boomert (Eastport/MD) with Lorenz Weinstabl (Atlantis Tankers/Director) before boarding the ATR 72 propeller airplane at KLM Jet Centre of Rotterdam Airport. Eastport Maritime’s invitation to a Porsche Leipzig experience was spectacular. Starting with the visit of a production site that incorporated the state of art of any automotive production facility. 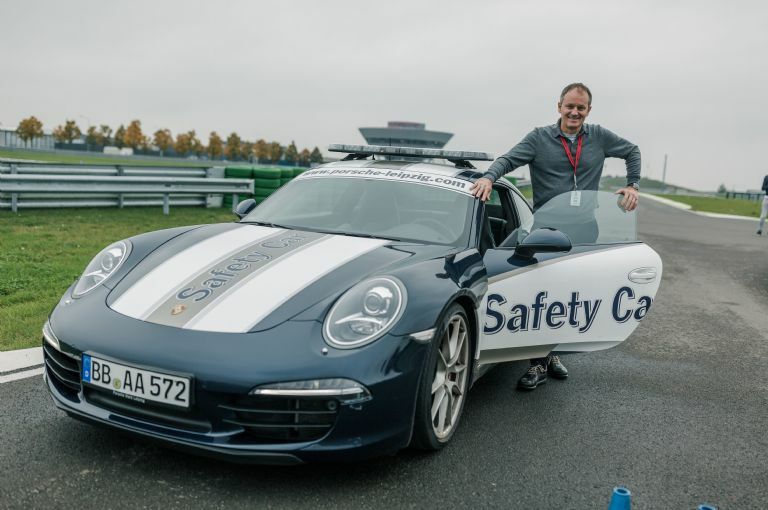 But the second part of the program consisted of driving anything that Porsche was producing, all models and all variants, on racing tracks and off road in the fields of Saxony. The instructor explained he experiences grown up men becoming young boys again when it comes to driving fast cars. That might be exciting to experience, but with years of steering his ship management to success our CEO Lorenz Weinstabl could not conceal his affinity to aspects of Safety. Eastport Maritime’s invitation to a Porsche Leipzig experience was spectacular! In the beginning of September, the Main Engine and Gearbox was lifted onto their foundation and into the engine room, enabling the yard to mount the engine room hull sides to close up the engine spaces. From this point forward, all other machinery will be lowered from the funnel opening to the engine room. We expect the hull to be completed within the month of October which will be the start of the equipment outfitting. In the beginning of September, the Main Engine and Gearbox were lifted onto their foundation and into the engine room. In a company internal dinner Armona's CEO expressed his sincere thanks to his managers for their extraordinary efforts serving the Borealis owned and Armona managed vessels in a period, in which the office staff was reduced due to employee's who seeked for new job opportunities in their career. Related to their maintenance condition, the Borealis owned vessels had consumed considerably more attention than the rest of the fleet. Excitement and satisfaction was exchanged that the team will now be able to focus solely on their own Atlantis Tankers fleet. 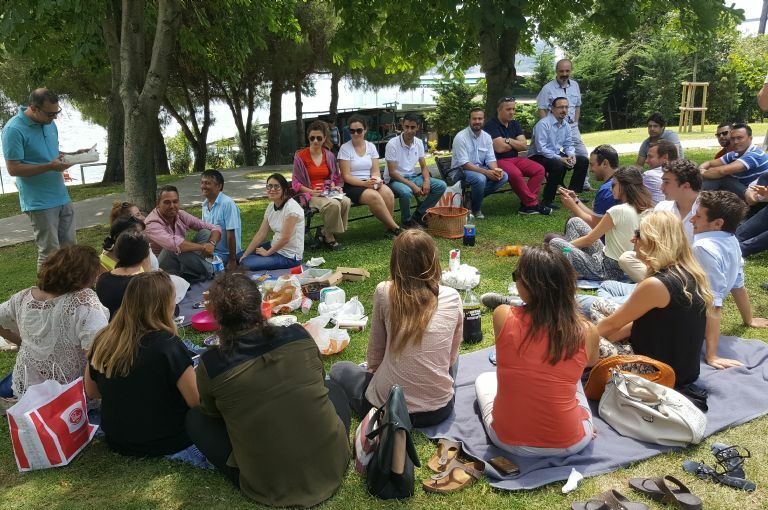 With the warm weathers and location of the Company, the staff members of Armona Denizcilik organized a picnic at the Cemil Topuzlu Park on the 26th of July to enjoy the beautiful view. Everyone brought different dishes that were mostly baked at home, and it was a huge success!